40 years is a long time to wait to fulfill a dream of honoring your father who died broke and forgotten and denied his legacy in the automobile world, the model airplane world, and the paper-making world. I am going to correct that as long as I am still alive. Here, we will concentrate on my father’s automotive history. He created sports car racing in Canada with Jack Luck in 1951. 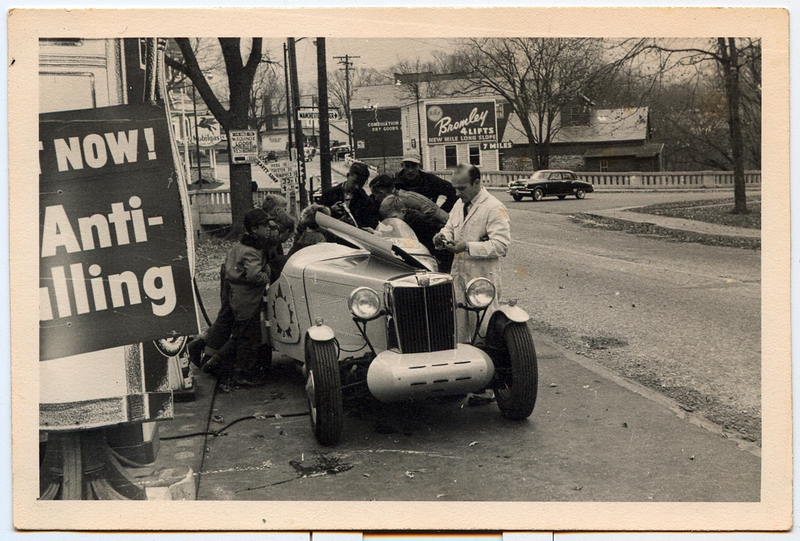 He bought a very early MG TC. He raced a highly modified TD for the MG factory, which was undefeated until it came up against a very early Glockler-Porsche in 1951. My dad immediately contacted Ferry Porsche in Germany and bought the first 356 in Canada in 1952, which arrived in May of that year (vin 11560). Understand, he was still at home living with his mother (awful woman) in Montreal and accomplished this on an engineer’s meager wages. My dad never even knew what a silver spoon was. Nor would he have cared. Author MarshallPosted on September 2, 2017 June 11, 2018 Leave a comment on What Have I Done? Just got off the telephone from talking with Rod from Llyod’s of Lone Pine. I bought my second cowboy hat—a Resistol felt—in 1991 from him. It was great to chat, and I hope to stop by and see him, and buy another hat, on the Quantum Run in May. As the sun cleared the Inyo Mountains and surfaced into a faultless sky, they sputtered in the direction of Lone Pine. The town lay squat and quiet, the wide main street with its wooden buildings like a Hollywood set awaiting a gunfight. On the right was the Silver Buckle Cafe. Inside, lacquered pine walls embraced the smells of coffee, bacon, sizzling potatoes, and toast. Tables covered in red and white checkered oilcloth glistened in sunshine, each with an identical still life of glass and chrome, a menu vertical between the familiar shapes. A waitress walked over with a steaming Silex and the roadside greeting, “Coffee?” more of a statement than a question since it was already pouring. The place smelled of leather the way a sawmill smells of freshly cut lumber. She rubbed the saddles, her graceful hand casually encircling a horn, her eyes finding his. She was always teasing him, and he didn’t know what to do about it. They wandered around examining all the riding gear, the cowboy and cowgirl paraphernalia. He noticed a flock of ten-gallon Stetsons along a wall, found one that fit—a Panama straw with Professional Bull Rider stamped inside the band—and the Eastern Dude in him flared uncontrollably. When he showed her, she laughed hysterically. Though he knew he had to conserve what little was left of his money, he bought it anyway. There’s a settling point in the drama of loss where the bottom dweller finds unusual pleasure in small things. As he viewed his image in the full-length mirror, he certainly realized that some might see him as a lean fool, but he’d always wanted a cowboy hat and, Pam’s laughter aside, thought he looked pretty damn sharp in it. They sent Greg a postcard with a red Greetings from Lone Pine, California across a high-noon view of town. It looked pretty much the same on that distant sixties’ day, only the cars were vintage. The Rambler would’ve fit right in. He drew a quick sketch of himself with hat, jacket, and sideburns accentuated, under which he penciled, Best, Eastern Dude, still unwanted, still on the loose. At the junction of Routes 395 and 136, there was a cluster of large leafy trees that formed a gateway to Death Valley and the east. Once they’d passed through that gateway, it was as if they’d entered another world. The land was so open and barren, he could feel it flowing into him, affecting him strangely. He hadn’t, but he felt unusually safe and peaceful. They were alone with the earth—no trees, no other cars, only a few vaporous clouds dusting distant mountains. Monstrous yet graceful slopes of sand ambled to the road, which curved in a gentle arc to the horizon. They motored toward that horizon, the cinemascope of the windshield ever changing. 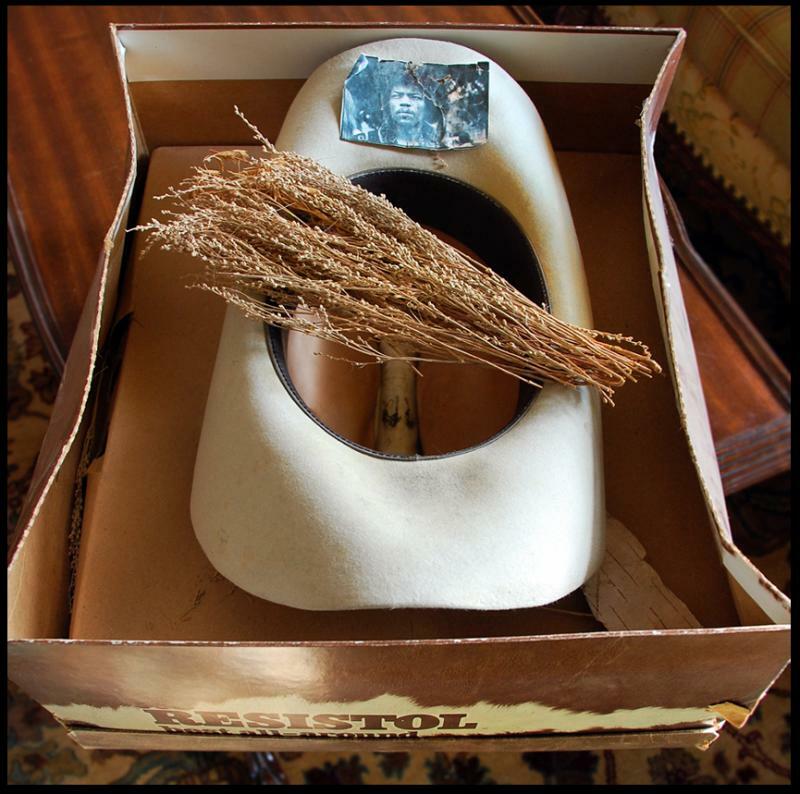 The cowboy hat I purchased from Rod in 1991 below. Below is the 50 inch pencil drawing I did in 1994 of me wearing the Resistol straw I bought in 1986. Where we are holed up for a week! All fast-forward drivers dislike backing up, particularly between narrow confines, thus the use of the tongue to balance such maneuvers.